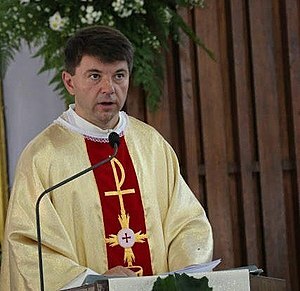 The titular Archbishop of Africa Vatican Ambassador to Zimbabwe, Archbishop Marek Zalewski has called on all presidential aspirants to be honest and keep their promises in the 30 July scheduled election. Speaking to the media following a closed door meeting with Vice President Constantine Chiwenga at his defense house on Tuesday, Archbishop Zalewski said elections should be peaceful adding that it is the duty of the church to encourage candidates to be honest. “The Vatican is a small state. We follow all the countries in the world, although we are not involved directly in politics of any country. Because you (journalists) say Vatican, we are supposed to say the Holy See, because the Holy See is the centre of government of the Church and the Holy Father, the Pope is the Supreme leader of the Church. “The Vatican State, the temporal state is very small, the smallest in the world but our government, when we speak about the government of the Church, we speak of the Holy See. The view is that in Zimbabwe, we have great historical chance to improve our country because the upcoming elections, will be an expression of freedom and development for the country,” he said. Archbishop Zalewski is a prelate of the Roman Catholic Church who serves as the titular Archbishop of Africa and is also the Apostolic Nuncio to Singapore and Non-Residential Pontifical Representative for Vietnam since May 21.